My 4 ounce bottle of Sage Away spray is the smokeless version of smudging. 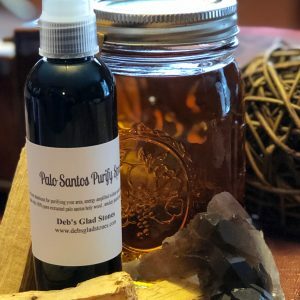 I use sage organic herb and extract it for 6 weeks & I make a smokey quartz elixir that take 4 hours to make using energies from pranic sun, both are unique to find in a sage spray. Smudging can be useful when you’re feeling depressed, angry, resentful, unwell or after you have had an argument with someone. It is common to smudge your space. You can smudge your home or work space as part of a general spiritual practice. Clear any negative or lingering energy with a smudging ritual. Set your positive intentions before spraying & then spray away the negative vibes whatever they may be.